Apostolic Titbits: Why Does God Take Young People So Soon To Himself? Why Does God Take Young People So Soon To Himself? He Glorified God In His Death By Keeping His Faith! Who is the Master of this garden called the earth? It is the one who has created it and to Him rightfully all things must bow, as He is the reason for all its existence (Col 1:16-17; Rom 9:20). Who is the gardener? All the humans to those whom God has given the responsibility to take care of his garden the planet earth are the gardeners (Gen 1:26-30). Whenever we ask God the question, 'Why Lord why?, etc...', we should remind ourselves that we are the gardener in this earth and that Jesus Christ is our Master and Lord who has saved us and rightfully owns everything including us for the furtherance of His own plan and purposes, and to glorify Him through our lives (1 Cor 6:20). Who plucked that flower? The Master of the garden did, and the gardener had nothing more to say; what could he say? Wisely, he held his peace. The Master’s decision was final. He owns the garden and only He knows His reason for plucking the flower mentioned in the above couplet. The garden belongs to the Master, and all the flowers are His. He knows every flower in His garden. He knows every bud about to blossom, every flower that has long shared its beauty with the world, and every flower that is about to fade away. And, to suit His over-all divine plan, He plucks flowers as He pleases. We all are flowers in the Master’s garden, and, in another aspect, we all are sojourners here (Psa 39:12), as well, for this world is not our home (Heb 11:13-14, 16; 13:14; 1 Peter 2:11-12, MSG). 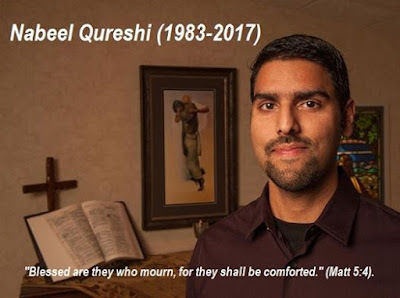 For some of us, our stay here is a long one (Psa 90:10), for others the stay it is short, and for sure for Nabeel Qureshi, it was short in which He glorified God and kept His faith until his very end. Entering into the joy of our Master Jesus Christ, he undoubtedly must have heard the words by now, “Well done, my good and faithful servant.” May we too as God's children, let us work faithfully for our Master Jesus Christ in His service until our very end.